It is a truth universally acknowledged (except by Donald Trump) that you can only win elections if a majority of people vote for you rather than the other candidate. Yesterday’s Ipsos Mori poll should therefore worry anyone who hopes to see a Labour government replace the Tories whenever Theresa May calls an election. While the Prime Minister, 100 days in post, still has around 50 per cent of the public ‘satisfied’ with the job she is doing, along with 80 per cent of Conservative supporters, the picture is very different for Jeremy Corbyn. 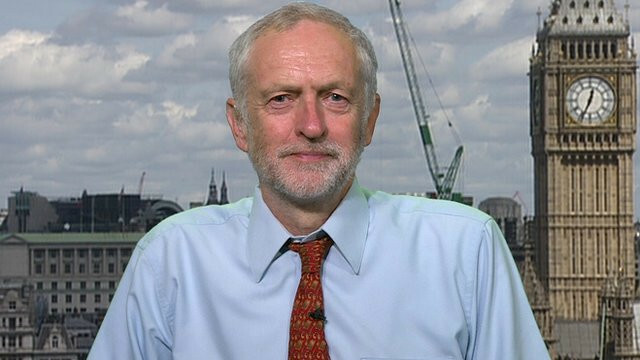 The Labour Party leader, re-elected with an increased mandate, has 54 per cent of Labour supporters ‘satisfied’ with his job as party leader. 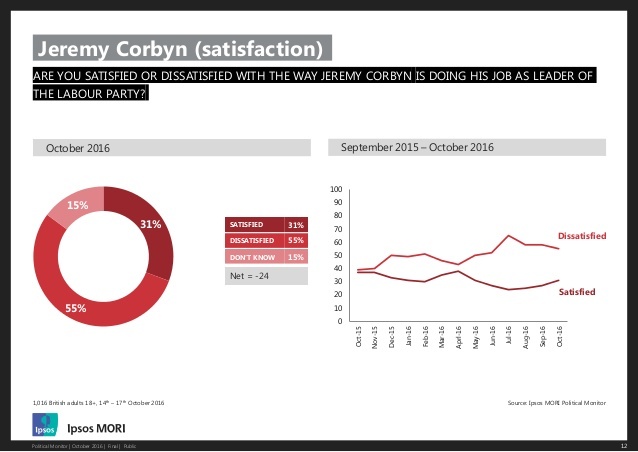 This compares with 32 per cent who are ‘dissatisfied’ and 14 per cent who ‘don’t know’. 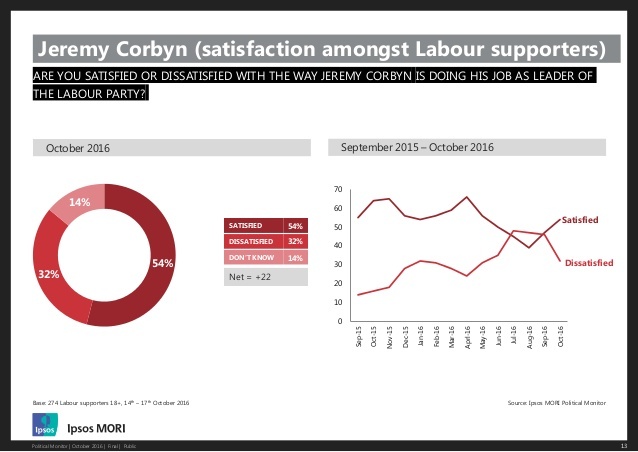 But among the general public, the same number, a hefty 55 per cent, say they are ‘dissatisfied’ with Corbyn, with only 31 per cent happy with his job as Labour leader. 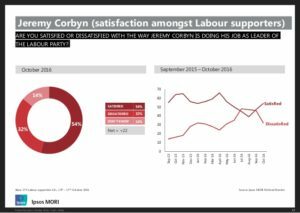 This finding is consistent with all the polling since Corbyn was first elected last year, and reflects, as in this latest poll, the near-perfect symmetry of opposite views about Corbyn in and outside the Labour Party. At party conference, Corbyn stressed unity and the need to take on the Tories, calling on Labour to take its vision to the country, and be on notice for a snap general election. Now that the leadership challenge is over, Labour will have to address the massive gulf between party supporters and the wider electorate, who have to be won over if Labour hopes to regain power in Westminster. But the first step to recovery – and yes, being 18 points behind in the polls, after a big election defeat last year, Labour certainly needs one – is admitting you have a problem. This means accepting that, where polls have been wrong in the past, they tend to overestimate Labour’s vote share, and that however popular Corbyn might be among Labour supporters, that feeling is not shared by the rest of the country. I somehow think this article will be lost on the present Labour membership . The PLP has done its best to undermine Jeremy Corbyn since day 1 and most of the Right-Wing media news is just full of the stuff – he’s unelectable, a misogynist, hopeless towards Jews, weak, pro-immigration, against nuclear weapons and NOT supported by his own MP’s. For those uninterested in politics they are unlikely to rate him and know few, if any, of his actual policies. 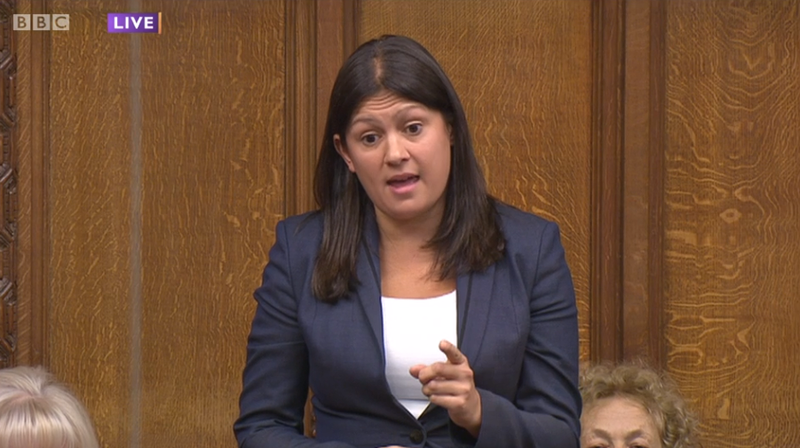 If the Labour MP’s and other Labour politicians don’t start being more supportive and encouraging the I doubt whether Labour will win the 2020 General Election – it is too divided, and self-destructive. Its a good example of how to ruin a good opportunity. The Corbynistas might try to spin it otherwise, but the voting public are not attracted to an old marxist who has claimed the IRA, together with Hamas and Hezbollah as ‘friends’ and attends rallies organised by SWP front organisations. However much the public might support rail renationalisation etc., they are not going to vote for a poor leader. Talking Heads and all that ….. I wanted a Labour government so that I could stop thinking about politics, knowing the the nation’s affairs were in the hands of a party which, even if often foolish, was at least well-intentioned. Now we have another decade of the self-interested and self-seeking, ready to sell off what’s left of our liberal institutions and loot the rest to their own advantage. It’s not a government of the nation, a true legarcy of Mrs Thatcher. 12 August 2016. I’m not a member of the Labour Party and so can’t vote. If I could, though, I’d vote for JEREMY CORBYN if only out of hope that the better part of salvation lies not in electoral calculation but in aspirations of the people. The Anti-Corbynistas might try to spin it otherwise, but the voting public are not attracted to a bunch of clowns who can’t win an election and then spend all their time complaining bitterly about a leader who has been massively democratically elected instead of getting on with the job of getting elected. They are not going to vote for poor MP’s. It’s hardly surprising that the polls show Corbyn behind May – he has a “mountain to climb” all right and it doesn’t help when he has 171 of his PLP, over half of the NEC, and his Deputy Leader trying to drag him down instead of helping him up. And now, following the mud slung at him by John Mann and co., regarding him tolerating “anti-semitism”, we now have “leaked” reports criticizing him as allowing homophobia in the party. It makes the job of the five, tax-avoiding Press Barons very easy to portray him as a no-hoper. Also, with the BBC political office now being to the right of Sky News he should at least be able to rely on Left Foot Forward to support him and the Labour Party membership. I am sad to see that prophecy has been fulfilled..